Obesity is the most common form of malnutrition seen in pets. It is defined as an excessive accumulation of fat in the body which eventually leads to adverse effects on health and your pet’s life span. 41 per cent of dogs and 32 per cent of cats were overweight or obese according to 2013 figures from Animal Health Alliance (Australia). Possible increased risk for certain forms of cancer. Obesity is usually caused by a combination of an inactive lifestyle and eating too many calories. Very rarely, certain hormone diseases can also lead to obesity. It is important that your pet has a healthy, active lifestyle and is fed strictly controlled portions to prevent your pet from becoming overweight and obese. Ideally, if your pet is a healthy weight you should be able to feel the ribs of your pet through a small fat layer. If you cannot feel your pet’s ribs or if they have lost their waist line, they are overweight. Weight loss is vital to the health of your overweight or obese pet, unless there is an underlying cause to your pets’ weight. 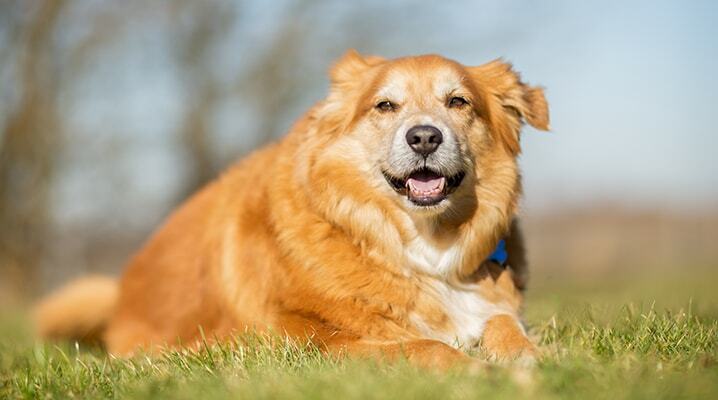 If you suspect that your pet is overweight, it is always best to seek veterinary advice. Avoid feeding your pet high-calorie table scraps and frequent feeding of dog biscuits and treats. It may be surprising to know that bones have a very high calorie content. Do not encourage or allow begging during meal times. This can be achieved by keeping your pet out of the kitchen during meal time preparation and gradually decreasing the amount of treats given. You can also substitute treats with attention, cuddles and play instead. Ensuring your pet is fed at the same time each day can also aid in preventing begging. Increased activity contributes to energy use that is necessary for weight loss. Always start with slow and low intensity of exercise especially if your pet is used to a sedentary lifestyle. As a general guide, 10 minute walks every day or every second day is a good start which should eventually lead to increased time and frequency. Walking, running, playing fetch and other games are recommended forms of exercise, though ensure to start slowly. Weigh your pet and set a goal for weight loss. Next, calculate your pet’s caloric requirement for maintenance of body weight (this can be discussed with your regular veterinarian). Feeding a diet that provides 60-70 per cent of the calories necessary for maintaining current body weight usually results in weight loss. Do not attempt to severely restrict calories as this can cause a rebound in your pet’s weight due to the effects of severe calorie restriction on the body’s metabolic rate. It is important to feed a well-balanced diet such as commercial pet foods that are formulated to contain adequate amounts of protein, fat, vitamins and minerals. You can obtain prescription commercial diets that are aimed at weight loss as they contain fewer calories either being low in fat and high in digestible fibre and carbohydrates. Alternatively, you may trial reducing the amount of food in your pet’s current diet. Reduce the amounts provided in each meal by one-third, and supplement with low calorie fibrous foods such as pumpkin or carrot. If you feel the need to feed the odd treat, most dogs and cats like pieces of carrot or broccoli stalks which are low in calories. For further information and to make an appointment for your pet, contact our General Practice.